We are very satisfied with the whole process, from the first visit to the removal of scaffolding. Chiltern Solar were informative and worked with us on options for panel types and layout to achieve the design that we needed. They were able to accommodate our timing request, with scaffolding erected on time and the panel and electrical installation taking only one day. Thanks to planning and obvious experience of the work team, everything went smoothly and we were generating electricity by 4pm. I have since observed.We are very satisfied with the whole process, from the first visit to the removal of scaffolding. 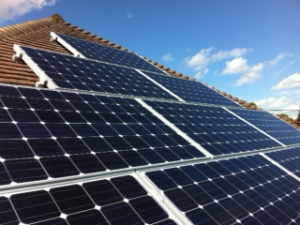 Chiltern Solar were informative and worked with us on options for panelWe are very satisfied with the whole process, from the first visit to the removal of scaffolding. Chiltern Solar were informative and worked with us on options for panel types and layout to achieve the design that we needed. They were able to accommodate our timing request, with scaffolding erected on time and the panel and electrical installation taking only one day. Thanks to planning and obvious experience of the work team, everything went smoothly and we were generating electricity by 4pm. I have since observed. types and layout to achieve the design that we needed. They were able to accommodate our timing request, with scaffolding erected on time and the panel and electrical installation taking only one day. Thanks to planning and obvious experience of the work team, everything went smoothly and we were generating electricity by 4pm. I have since observed.